Since the introduction of the Sunwayfoto FB Series Lightweight ball heads in July 2012, I have many times referred to their improved versions or the addition of newer models into the series. However, the arrival of the Nest NT-6294C Carbon Fiber Traveler Tripod for evaluation and review, without the native Nest ball head, was a good opportunity to combine it with a ball head of matching characteristics. 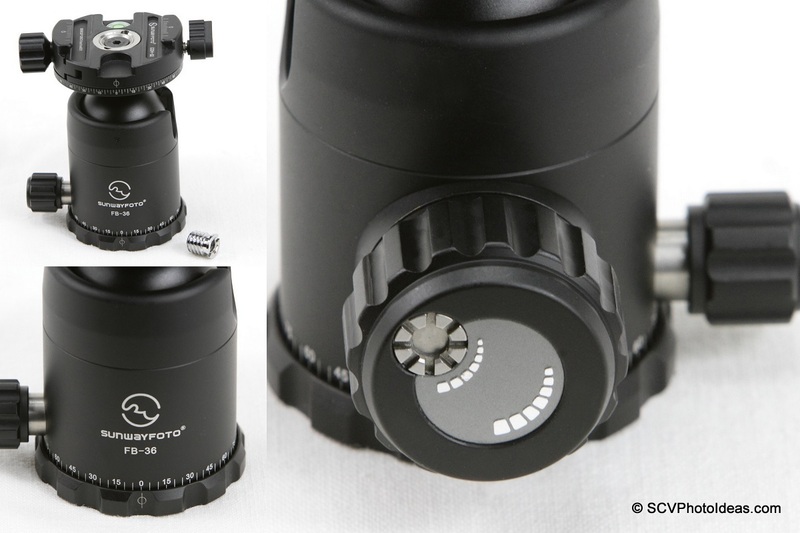 Specifically the Sunwayfoto FB-36DDH lightweight ball head which was equipped for the purpose with the DDH-02 panning QR clamp. In this way I could both maintain a very transportable solution and also have the chance for a long term test and separate review of an FB series ball head. My long term good experience with the Sunwayfoto DB-36TRLR Traveler Ball Head (reviewed in Mrach 2012), undoubtedly set a standard on what to expect from the performance of a traveller ball head. So let's see how the newer and lighter FB-36 copes. Starting from May 2012 all Sunwayfoto ball heads are boxed in shrink-wrapped recycled carton boxes and travel well padded with thick foam, accompanied by a good quality 1/4"-20 to 3/8"-16 conversion bushing, Allen hex wrench for the clamp, manual, warranty card etc. However, by request, my sample arrived with only the necessary basics, pre-mounted on the Nest NT-6294C CF Tripod as mentioned in the beginning, in order to save on shipping etc. 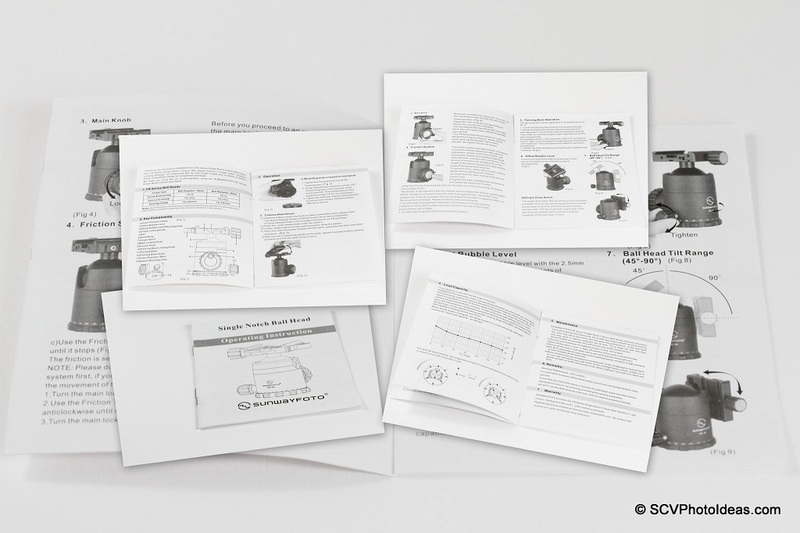 Among the "basics" was the Sunwayfoto FB Series Operation Instructions multipage manual divided in two (good) English and Chinese sections, fully illustrated with examples as well as maintenance and warranty topics. The FB-36 is another very fine example of Sunwayfoto's high quality finishing. The body shell and the quick release clamp are hard coat anodized in a very dark shade of grey with a satin finish. The ball head front is occupied by the white laser engravings of company logo, brand name and model name. The friction control and panning lock knobs are black with large grooves on their perimeter set at a 90° angle for better fitting withing the folded back traveler tripod legs. This latest FB-36 version sports an aluminium disk on the large main Friction / Lock-Knob with two wrought in relief scales increasing clockwise. Both indicate the direction in which the locking force increases, one for the main knob and one for the friction set thumb screw. The panning base is grooved with a Φ index within one of the grooves. The panning scale is quite visible due to the white laser engraved markings on the body shell with small lines every 5 degrees and numbers every 15 degrees ranging from 0 to 90 and back to 0. (bottom left photo). The ball head bottom has no visible screws or openings other than the central 3/8"-16 threaded hole for mounting on a tripod. This can be converted by the included bushing to 1/4"-20 thread. Around the center hole exists a silver-grey aluminium plate with wrought in relief the Sunwayfoto logo and "Made in China" while the ball head serial number is laser engraved on the perimeter. According to Sunwayfoto literature, their ball head balls are ellipsoidal but closer to spherical form than balls made by other manufacturers. At present, on most ellipsoidal ball heads in the market, the Y-axis diameter of the ball is about 0.07mm longer than the X-axis, in order to compensate for the extra torque generated when the ball is tilted to the side, by increasing the friction and thus minimize drift or drag. On Sunwayfoto ballheads the ball Y-axis diameter is 0.03mm longer than the X-axis, leading to a smoother operation, while retaining the previous advantage. The 36 mm diameter ball is very finely finished and very smooth in operation right out of the box. One can sense immediately its ellipsoidal form by tightening a little the main Friction / Lock-knob and moving the ball around by hand. The ball movement stiffens gradually the more it is tilted away from the vertical position. By removing the quick release clamp the short ball stem is revealed. Since the DDH-02 Panning Clamp has a 3/8"-16 threaded center hole and is optimized for M6 size screws, a special conical adapter is provided in order to enable attachment of the DDH-02 with an M5 screw on the FB-36 (top photo). Apart from the obvious anti-twist bosses beside the M5 threaded center hole, there is a hard Teflon ring fit around the stem of the ball. Although I have not succeeded having any relevant technical information from the factory, in my opinion this ring serves to protect the stem and the body shell from friction when the ball is tilted on the perimeter or within the drop notch. FB-36DDH differs from the standard FB-36, since the standard DDC-42 QR clamp is replaced with the extra compact and lightweight Sunwayfoto DDH-02 Panning Clamp (reviewed October 2012). This combination is still lighter than the previous Sunwayfoto DB-36TRLR Traveler Ball Head (reviewed March 2012) and offers a very versatile solution for shooting leveled Panoramas with lighter equipment, while on the go. The DDH-02 panning quick release clamp with its 52mm diameter fits well the narrow footprint of the total structure. Although a little larger than the standard 42 mm QR clamp there is no interference between the clamp and the ball head body shell. Even when fully tilted in the drop notch there is enough clearance between the QR clamp knobs and the ball head base. 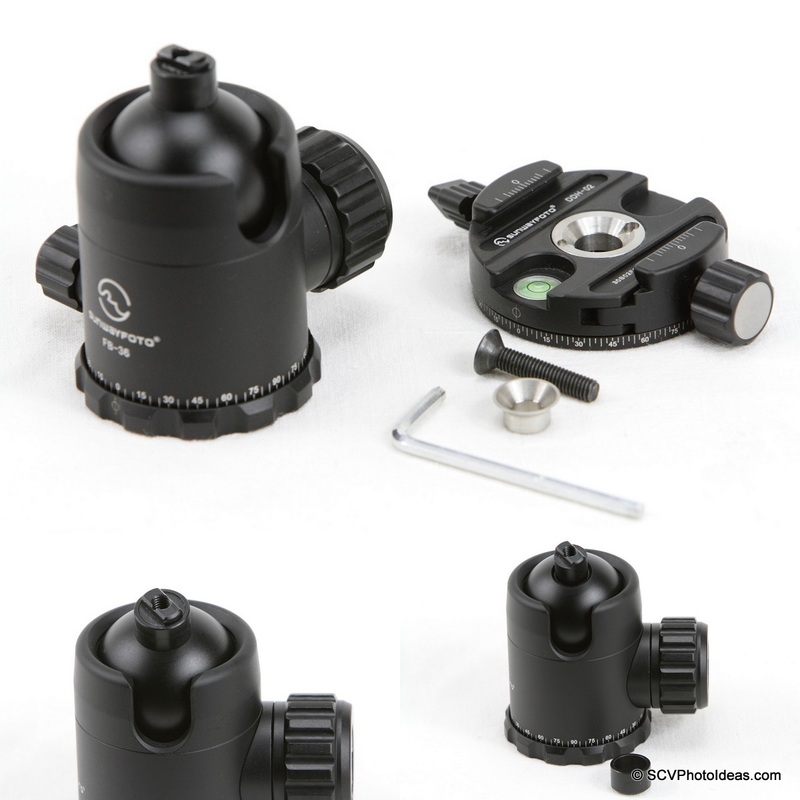 Another available version of the FB-36 ball head is the FB-36DL combined with the Sunwayfoto DLC-42 Duo Lever/Knob Quick Release Clamp (reviewed also in March 2012) which is ideal for fast exchange of gear on top of the ball head via its lever release. Further it permits fine tuning for any width of Arca-Swiss® compatible rail or plate as it offers gradual jaw control via the screw knob. The DLC-42 Duo Lever / Screw Knob QR clamp by default has a 1/4"-20 thread center hole with a narrower diameter counter sinking, therefor it is just appropriate for the FB-36 M5 clamp mounting screw. Once again the DLC-42 Duo QR fits well the narrow footprint of the total structure. Althouhg the existence of both a Lever and a Screw Knob at opposite sides make it longer than the standard 42 mm QR clamp there is still no interference between the clamp and the ball head body shell in any position. As I have mentioned in the Nest NT-6294C Carbon Fiber Traveler Tripod Review, I decided to enhance the tripod's strong points like stability and lack of vibration with a high quality lightweight ball head. So all reference for now will be for that specific tripod/ball head combination. By fully tightening the panning base lock knob first, the ball head can be easily screwed and tightened on the 3/8"-16 tripod stud and optimally secured on the top plate by the relevant top-plate security screw. The ball head weighs only 325 gr when equipped with the DDH-02 panning clamp, adding very little to the transportable weight reaching a total of 1807 gr. The Sunwayfoto FB-36DDH's small foot print fits perfectly between the 180° folded back legs of the Nest NT-6294C Traveler Tripod. 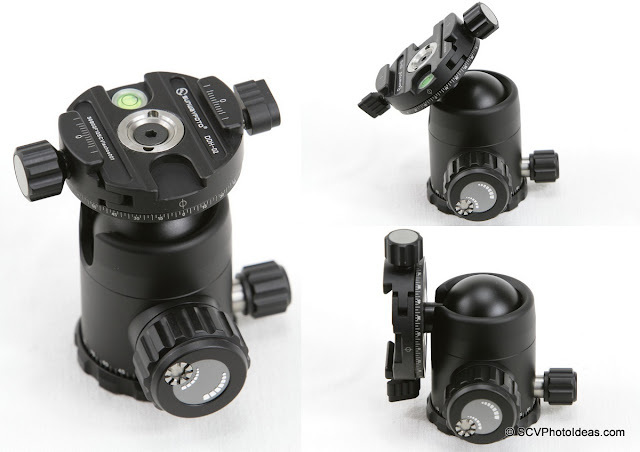 Due to the ball head control knobs arrangement at 90° the tripod legs may fold fully and perfectly between them despite the large twist-locks. The small diameter (∅ 52 mm) of the DDH-02 panning QR clamp does not cause any interference with the legs either. The outcome of the Nest NT-6294C + Sunwayfoto FB-36DDH combination has proved a very stable and functional traveler solution, based on the results pictured in the Nest NT-6294C Carbon Fiber Traveler Tripod Review. After having used the FB-36DDH for a few months now, I'm in a position to comment on the characteristics and functionality of this really lightweight ball head. Faithful to the Sunwayfoto quality standards, the hard coat anodizing on the ball head shell is excellent, it is non reflective, does not show hand / finger prints and proved scratch proof. It will take hard abuse to chip off the paint job (anodizing) since I mounted and dismounted it quite often on tripods even dropped it on the ground without any signs of wear up to now. The Main Friction/Lock knob has a quite long travel, since it takes one and 3/4 rotations of the knob from the completely loose (friction limiting thumb screw completely unscrewed) to the fully locked position. However, the first half rotation does not seem to have an effect on the ball as it remains loose, but still a quite long drive of one and 1/4 rotations is left for ball friction adjustment. This permits a smoother, yet more precise friction control and one may find easily the absolute "sweet-spot" for his/her camera/lens combination. Minimum Friction control is achieved via the limiting thumb screw on the Main Friction/Lock knob which is common to ball heads following the Arca Swiss® lock mechanism design. Once you set the desired minimum friction by tightening the main Friction/Lock-knob then turn the thumb screw clockwise until it stops. The thumb screw acts as a limiter and the lock knob may not unscrew back either intentionally or accidentally beyond that set point. As I had pointed out in the past, this is a more expensive mechanism to build but it is more precise as the locking force applied to the ball is bi-lateral and more even than other solutions. The panning base is fluid and its Lock knob is equally smooth in operation with quite a long drive of two full rotations as well, but it is the last 1/4 turn that is actually effective as a panning friction control up to a complete pan lock. And it locks well as we shall see next in the torque test results. The ball head passed easily all preliminary load, ball and pan lock torque tests, just to prove that manufacturer specification is up to par. The maximum measured Torque for the ball was approximately 79.5 KgF*cm (~779.63 N*cm). If we follow the manufacturer's method the number may be translated to a 19.87 kg load directly on the ball head clamp. This is a little higher than the 18 kg declared by the manufacturer, but I have to confess that in order to achieve that I almost broke my fingers tightening the large Friction/Lock knob. This number according to the Gitzo® measuring method - which anticipates for a logical offset position of the center of gravity of a camera / lens combination away from the ball pivoting center by 12 cm (4.7") - means that the ball head will bear a maximum load of 6.625kg. The maximum measured torque for the pan lock was approximately 47.7 KgF*cm (~467.78 N*cm) meaning that the panning base locks well and can hold a front heavy camera / lens combo in horizontal position without sagging. For normal use there is no need to tighten the ball Lock-knob so much. Since numbers may not be so comprehensible by everyone, I made a couple of photos to illustrate how can the head cope with fully front heavy combinations like a camera equipped with long telephoto lenses but clamped on the FB-36 by the camera L bracket. Quite a burden but it required less than a full turn of the Friction/Lock knob to achieve this. Sunwayfoto DB-36DDH mounted on the Nest NT-6294CT supporting a Canon EOS 7D plus BG-E7 battery grip with the EF 100-400 L IS USM fully extended at 400 mm. The camera combo is clamped on the head by the camera L bracket. Same setup but with the EF 70-200 f2.8L IS USM clamped again on the head by the camera L bracket. The locking strength combined with the good stability of the head can allow lenses up to a focal length of 400mm to be handled, which makes it a good traveler companion. For this estimation I take into account lens lengths and weights, properly balanced on the ball head. Sunwayfoto DB-36DDH mounted on the Nest NT-6294CT supporting a Canon EOS 7D plus BG-E7 battery grip with the EF 100-400 L IS USM fully extended at 400 mm. This time the combo is properly balanced on the lens collar foot. However, to be on the safe side I would recommend the ball head for lenses up to 200mm f2.8 in order to anticipate for windy conditions. Although I have tested the head with a 400mm lens in clear weather with no winds and know that the ball head can cope with more, for longer focal length and heavier lenses, using bigger ball head models with a larger diameter ball will prove more beneficial in terms of vibration absorption and smoothness of operation. All the above are valid of course, as long as the ball head is combined with a quality, vibration free tripod. Sunwayfoto DB-36DDH mounted on the Nest NT-6294CT supporting a Canon EOS 7D plus BG-E7 battery grip with EF 70-200 f2.8L IS USM lens balanced on the lens collar foot. Shot during an assignment last year. The FB series of ball heads shares some characteristics that differentiate them from their equivalents in the former heavier and more expensive Sunwayfoto DB series of ball heads. The double drop notch of the DB Series has given its place to a single drop notch for portrait orientation or a deep tilt forward or backward. With a single drop notch a little versatility is lost, as the head has to be turned around in order to bring the drop notch at the desired position. But on the other hand this design change permitted first lowering the weight adopting a thinner body shell and second the relocation of the main Friction / Lock knob from the right to the left side of the ball head shell. A fact that will make happy a lot of users who felt the right position of te main Friction / Lock knob awkward. Further, there is no friction scale ring around the main knob any more. Furthermore, the former diamond pattern on the large main Friction / Lock knob perimeter gave its place to deep CNC machined grooves. Finally, the FB series has a completely different Panning base design from the DB series. The laser engraved panning scale is more visible than before and is relocated from the panning base to the head body shell, while the panning index was relocated from the body to the panning base and changed into a large and clear Φ mark instead of a small triangle pointer. Now, according to Sunwayfoto, the FB series is lighter while the Ball locking strength is enhanced by 20%, and the panning base locking strength by 50% . Well, I can only confirm that the FB-36 is lighter, otherwise torque figures for the ball lock and pan lock strength of the DB-36 are almost identical. Maybe Sunwayfoto engineers had in mind the larger models, but unless I confirm in a test there is no point for speculation. Gradual ball friction control that permits fine tuning. Very smooth operation in all aspects. Excellent value for money ratio. 6 year limited warranty extension upon registration. Deceptive long drive of Lock Knob which may frustrate users until they utilize the friction limiting thumb screw. Since I was very satisfied with the smoothness of operation and load bearing capacity of the DB-36 traveler, I cannot be less satisfied with the FB-36 which maintains the same characteristics in a lighter and cheaper package. The lack of a second drop notch is not of much importance as L brackets are getting cheaper and more popular nowadays. What matters is that you get a quality lightweight traveler ball head with a great value for money compared to many competitor models. This review and test was run on a single product sample, based on the specifically described methods. Although the findings are good and overcame the expectations for the product, it can not be used as a rule, unless more samples of the same product are tested. Furthermore, similar comparison tests should be run with comparative capabilities products so as to reach a solid conclusion. Note: The Sunwayfoto FB-36 Ball Head presented in this article was kindly offered by Desmond Photographic Distributors, USA, for evaluation and review. 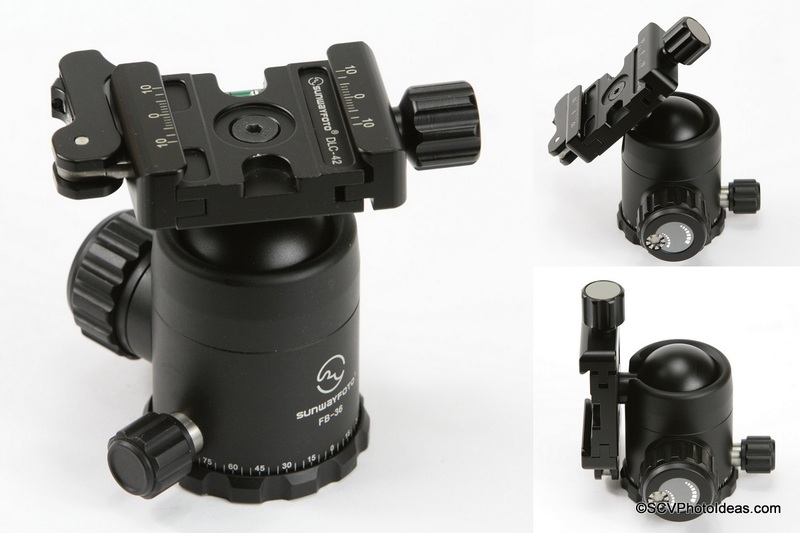 Current Sunwayfoto FB-36 ball head prices range from US$ 146.00 to US$ 186.00 according to the the QR clamp type. (+ Free shipping in the US). All versions of the FB-36 Ball Head are available from Amazon or from eBay worldwide.